Desserts shouldn’t be complicated. Which is why we’ve created a hassle-free, sugar-free decadent recipe that is great for all those following a keto diet, will satisfy your sweet tooth and can be whipped up in 10 minutes or less. Wait. Say what? You heard that right! Whether you’re making this dish for yourself, or for you and your friends (ehem… me, myself, and I), we’re sure you’ll have this recipe on repeat like that Bruno Mars song you’ve had stuck in your head for months. Being that MCTs are easily digest, anti-inflammatory, and ready to be used for fuel almost instantly, studies have shown that they can help reduce blood triglyceride levels and improve lipid profiles. This results in a decrease of cardiovascular disease [*]. Pumpkins are abundant in carotenoids, which are specific types of antioxidants, and lycopene, which is a specific type of carotenoid. Lycopene is responsible for maintaining a healthy blood pressure, reducing oxidative stress, and boosting mortality in those suffering from metabolic syndrome (which lead to increased risk for heart disease) [*][*]. Collagen is the most abundant protein in our bodies. Think glue. As we age, so does the of collagen in our bodies. This can cause a lot of health issues, including leaky gut, IBS (irritable bowel syndrome), wrinkles and fine lines, and achy joints. In numerous studies, collagen has been proven to show significant changes when taken as a nutritional supplement. Some resulted significant improvements when collagen supplementation was used as a treatment for Osteoarthritis and other joint disorders [*]. Another controlled study done on athletes taking collagen hydrolysate over a period of 24 weeks. During that time period the athletes supplementing with collagen hydrolysate noticed and enormous decrease in their aches, pains, joint stiffness, and overall inflammation [*]. MCTs provide our brain and body with the proper energy it needs to flourish. They provide support to the central nervous system, which is directly linked to brain health. They also help reduce inflammation and improve brain function by stabilizing your blood sugar levels [*]. Because MCTs are easily digested and instantly used for fuel, they make ketones readily available for the body to use. 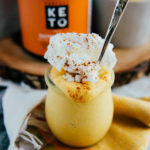 When ketones are readily available, ketosis is accomplished sooner, which is exactly what you want to hear when following the ketogenic diet. When talking about coconut milk/cream, it’s good to know that about 93% of its calories comes from MCTs, which means it will help reduce inflammation, increase energy expenditure, and enhance physical performance. Coffee is loaded with antioxidants that boost your energy and concentration levels with a lovely dose of caffeine. Studies have also shown that coffee improves attentiveness, as well as physical endurance and performance [*]. This Pumpkin Mousse jam-packed with all the ingredients you need to keep you fueled and energized throughout your day. It’s rich, creamy, completely satiating, and will leave you saying, “Oh my gourd” when you run out… so you might as well double, or triple up! In a medium-sized bowl, add all the ingredients for the pumpkin mixture and, using a hand mixture, mix until well-combined. Place mix in the fridge. Add the heavy whipping cream, vanilla, salted caramel to a chilled bowl and whip until relatively stiff peaks form. Transfer to a serving glass with additional whipped cream and enjoy! Or place in the fridge until ready to be served.